Invest in your sight and eye health with an annual eye exam. See your best and look your best with fashionable eyeglass frames and contact lenses. Finding the right pair of eyeglass frames should be easy and affordable. We carry affordable and designer eyeglasses for adults and children as well as popular brands of contacts. We also carry specialized frames from Miraflex and Specs-4-Us for children and babies who have problems keeping eyeglass frames on their faces. 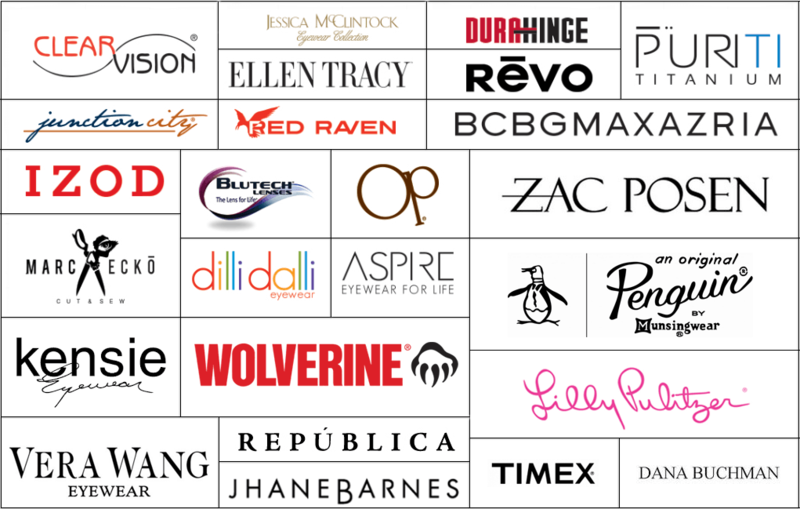 We have a wide variety of designer brands and styles for you to choose from to find your perfect fit and style. We use the best technology in our lenses to ensure that you are able to see cleaner and clearer than ever before. Each pair of glasses is meticulously inspected to give you the best quality lenses and frame to fit your needs. Our staff is pleased to recheck your eyewear after your purchase to reassure you of its accuracy. We will keep your eyeglasses clean, fitting right, and feeling like new at no extra charge for as long as you own them. Fashionable and specialized frames for children, babies and adults. Erin’s World frames by Specs4Us are specially designed frames made to accommodate the unique facial features of children and adults with Down Syndrome that have a flat-bridged nose. These frames are made to accommodate and fit those with Down Syndrome, which makes it superior to all current frames. Unlike other frames, the bridge is adjusted to fit on the unique features of the nose and the temples (a.k.a. arms), that are modified to keep the glasses from constantly slipping. With a pair of Erin’s World frames your loved one will no longer be constrained by their eyeglasses. The innovative design enhances their opportunities to explore the world freely and clearly without having to wear glasses that are too big, uncomfortable and constantly slipping or falling off. These frames are made for their unique needs and features in mind to solve the problems that regular eyeglasses never could. The Miraflex frame is crafted from a flexible plastic material with no metal parts and hinge-free temples. The non-metal components of theses frames will reduce the risk of facial and eye trauma, which increases safety for your baby, your toddler or for those that are active with sports. These frames are safe and incredibly resilient. These frames are not only comfortable, they are also BPA Free, Latex Free, Rubber Free, Hypoallergenic, Antibacterial, and easy to clean. The frame is completely manufactured out of a single piece of malleable material and it comes with an elastic adjustable band, which will keep the frames snug and centered. The unique light malleable material is designed to adjust to your child’s individual face. Also, the bridge is anatomically designed to fit even petite sizes, which makes early eyewear acceptable. Our caring and highly-trained vision experts are here to help. What are Yoked Prism glasses? Yoked Prism glasses are prisms worn in a pair of glasses. They’re prescribed to enhance therapy or to help treat patients who are unable to go through the regular vision therapy program due to cognitive difficulties or problems complying with the home support requirements. Yoked prism, when used wisely, can passively provide many of the benefits of vision therapy when a person is not in the therapy room. When these prisms are worn in a pair of glasses, they have the ability to engage the visual attention of a person. They also provide feedback on problems with visual aiming and spatial organization. Other amazing benefits of wearing yoked prism glasses: Another amazing result of wearing the glasses is that they can stimulate changes in the brain to help improve visual, postural, balance, and coordination function. We have also found these lenses to be extremely useful in breaking down patterns that have developed over time to cope with visual conditions so that we can instill new and more efficient patterns of vision. Who are Yoked Prism Glasses For? To find out if Yoked Prism Glasses are for you, make an appointment. Have you or your loved one been struggling with reading difficulties? Have you been told that you are prohibited from certain employment due to color deficiency? ChromaGen lenses can help. Research has found that ChromaGen lenses have been a life-changing aid for people who struggle with reading problems caused by vision, and also as an optical solution for color blindness. Arizona Vision Therapy Center understands how disheartening it can be when you believe that there is nothing else out there that can help you. Dr. Amy Thomas is the only Certified ChromaGen Practitioner in the state of Arizona and is able to help you understand what you are going through. Dr. Thomas is proud to help those with reading disabilities and also those with color deficiency. She will customize your ChromaGen prescription to immediately help you to see the difference.